Magelys Pro tourist bus | TEZAS servis a.s.
Popular minibuses IVECO Daily. Authorized sales and service. Service and all other repairs of IVECO Bus, Irisbus, KAROSA. Luxury tourist and intercity IVECO buses with unique designs. The whole range of assortment spare parts, accessories and options. Comfortable city buses, now completely new URBANWAY! Sales & Service Centre of IVECO Bus. TEZAS servis a.s., since 1953. Tourist buses of the popular MAGELYS PRO series get well deserved attention on the road. They are typical for their timeless design and distinctive lines with original features, which immediately attract and cannot be overlooked without notice. Also, they offer exceptionally comfortable interior, with a great sense of detail and premium quality of materials. The MAGELYS PRO tourist bus is a successful successor to its predecessor model. The bus is designed for long-distance transportation of passengers, especially on international routes. The coach with its high added value literally inspires to travel, thanks to its ultimate luxury for passengers. The high standard of travel is guaranteed thanks to the combination of new technical features and technologies. For example, the unique roof design with wide glass arches provides the passengers with panoramic views of the surroundings. The MAGELYS PRO tourist bus features spacious and luminous interior. The optimized thermal comfort and its regulation are naturally included, too. Attractive technologies are available: Wi-Fi, USB connections, power sockets and a board system for entertaining the passengers. The interior design is full of innovations, including new lighting, with 100% integration of LED lights. Wide range of customized solutions will satisfy any needs for relaxation and fun while travelling. This includes the maximum comfort for the driver and passengers, with the possibility of adjusting the interior design on request and the supply of optional board equipment. MAGELYS PRO also allows different seating arrangement, including the installation options luxurious seats, e.g. for the transportation of VIPs. The MAGELYS PRO tourist bus was designed with the intention of reducing fuel consumption and satisfying even the most demanding operators. This is achieved thanks to the unique power unit with the variability of the gears for the rear axle. 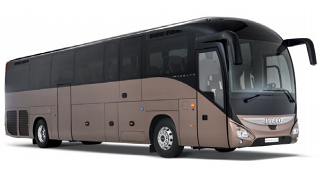 The coach is also equipped with advanced technologies for active and passive safety. We supply the MAGELYS PRO tourist bus in two lengths, i.e. 12.2 and 12.8 metres. There is a version with a ramp for wheelchairs and space reserved for disabled passengers.